Advanced Sensors Technology: What’s at “Steak”? A transducer is the generic name given to devices that convert an input stimulus into a measurable signal. Precision weighing or force transducers based on strain gage sensors convert the mechanical input of an object, typically the object’s mass or the reaction force caused by a weight applied to the transducer, into a measurable resistance change. Foil strain gages are the primary type of sensors in many varieties of transducers; their versatility is unmatched in the sensor world. It is possible to measure weight, force, torque, acceleration, displacement, pressure, number of widgets in a box and even the growth rate of a tree -- all with a foil strain gage. The ability to weigh items from a few ounces to over 1M pounds is a common application. Consider the steak you purchase at the market. You can witness the butcher weigh it on a strain gage-based price-computing scale. 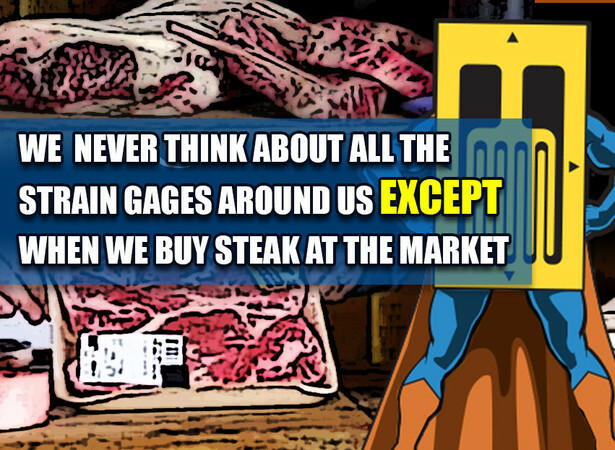 Did you ever consider how many times strain gages were used prior to your steak purchase? When the calf is born it is weighed. As the calf grows it is weighed. The food used to feed the calf is weighed. The fertilizer used on the calf’s food source is weighed. The fertilizer coming from the cows themselves is weighed as it is applied to the fields. When the meat products are shipped to markets they are weighed on shipping scales. If you don’t finish your steak the leftover meat and maybe even your napkin will end up in a trash bin that is weighed when it is picked up. And finally, if you do eat all of your steak chances are you will weigh yourself on your bathroom or doctor’s office scale, and yes, these will almost certainly use foil strain gages. The Micro-Measurements product portfolio with Advanced Sensors Technology includes linear, shear and circular gages, arranged as individual, half-bridge and full-bridge configurations, in ranges from 350 Ω to 20 kΩ, with added flexibility in mounting options. The technology improves grid-to-grid tolerances and matching over traditional strain gage manufacturing techniques, enabling better sensor performance. In the case of full-bridge gage configurations, all intra-bridge connections are integrated directly into the pattern itself, eliminating the need for traditional intra-bridge soldering. The addition of gold-plated solder pads improves solder-joint reliability, while reducing the risks of solder pad oxidation prior to lead wire attachment. These processes further ensure the close matching of grid-to-grid thermal characteristics and bridge circuit thermal output cancellation specifications, both of which are essential to strain gage measurement accuracy. For more information regarding Advanced Sensors Technology, or other product and technology offerings from Micro-Measurements, visit www.micro-measurements.com.